For theoretical background, see Heat pump and refrigeration cycle. A heat pump is a machine or device that transfers thermal energy from one location, called the “source,” which is at a lower temperature, to another location called the “sink” or “heat sink“, which is at a higher temperature. Thus, heat pumps move thermal energy opposite to the direction that it normally flows. While compressor-driven air conditioners and freezers are technically heat pumps, the class includes many other types of devices, and the term “heat pump” usually implies one of the less-common devices in the class that are not dedicated to refrigeration-only. During the operation of a heat pump, some of the thermal energy must be transformed to another type of energy before reappearing as thermal energy in the heat sink. The heat pump uses mechanical work, or some source of thermodynamic work (such as much higher-temperature heat source dissipating heat to lower temperatures) to accomplish the desired transfer of thermal energy from source to sink. In the classical thermodynamic sense, a heat pump does not actually move heat, which by definition cannot flow from cold to hot temperatures. However, since the effect of the device in moving thermal energy is the same as if heat were flowing (albeit in the incorrect direction with regard to temperature difference), the “heat pump” is named by analogy. A heat pump always moves thermal energy in the opposite direction from temperature, but a heat pump that maintains a thermally conditioned-space can be used to provide either heating or cooling, depending upon whether the environment is cooler or warmer than the conditioned-space. When pumps are used to provide heating, they are used because less input from a commercial-energy source is required than is required for newly-creating thermal energy by transforming heat-free sources of energy (for example, electricity) or low-entropy sources of energy (for example, a gas flame) directly into the required heating. This is because the heat pump utilizes some thermal energy from the environment for part of the delivered-heating, increasing the “efficiency” of the process. In cooler climates, it is common for heat pumps to be designed only to provide heating. Even when a heat pump is used for heating, it still uses the same basic refrigeration-type cycle to do the job (merely changing operation so that the warm end of the device is inside the conditioned space, heating it). 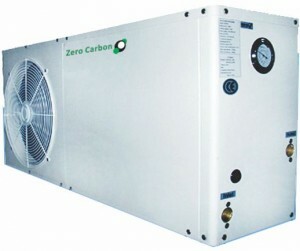 Such heat pumps, which always provide heating of spaces, may be found in climates that never or rarely require cooling. For the class of “reversible-cycle heat pump” devices designed to work in either thermal direction, the device simply operates in a way that changes which coil is the condenser, and which coil is the evaporator, rather than physically turn the device around. Such a switch in function is normally achieved by a “reversing valve.” Reversible-cycle heat pumps are often seen in providing building-space heating in high latitude climates that are much warmer than comfortable in one season, but colder in another season. In heating, ventilation, and air conditioning (HVAC) applications, the term heat pump normally refers to a vapor-compression refrigeration device that includes a reversing valve and optimized heat exchangers so that the direction of thermal energy flow may be changed without loss of efficiency. Most commonly, when used in heating, heat pumps draw heat from the air or from the ground. Heat pumps have the ability to move thermal energy from one environment to another, and in either direction. This allows the heat pump to effectively bring thermal energy into an occupied space, or to take it out. In practice, this is always done in the opposite direction of a temperature gradient. A heat pump works in the same manner as an ordinary air conditioner (A/C), which itself is a type of heat pump. In the warming mode for a space, a heat pump effectively reverses a refrigeration unit so that the warm radiator is inside the space, rather than outside. In classical thermodynamics, heat is defined as a movement of energy in the direction of a thermal gradient, and in this strict sense a “heat pump” is misnamed, since by definition, classical heat cannot be moved or pumped from colder to warmer temperatures. In fact, some of the energy moved by heat pumps is moved in the form of thermodynamic work, and often mechanical work (a narrower definition of work), and not as heat. However, since the effect is somewhat the same (thermal energy disappears in one place and reappears in another), the device gained its name by loose analogy. A heat pump uses an intermediate fluid called a refrigerant which absorbs heat as it vaporizes and releases the heat when it is condensed. It uses an evaporator to absorb heat from inside an occupied space and rejects this heat to the outside through the condenser. The refrigerant flows outside of the space to be conditioned, where the condenser and compressor are located, while the evaporator is inside. The key component that makes a heat pump different from an air conditioner is the reversing valve. The reversing valve allows for the flow direction of the refrigerant to be changed. This allows the heat to be pumped in either direction. In heating mode the outdoor coil becomes the evaporator, while the indoor becomes the condenser which absorbs the heat from the refrigerant and dissipates to the air flowing through it. The air outside even at 0 °C (or at any temperature above absolute zero) has heat energy in it. With the refrigerant flowing in the opposite direction the evaporator (outdoor coil) is absorbing the heat from the air and moving it inside. Once it picks up heat it is compressed and then sent to the condenser (indoor coil). The indoor coil then injects the heat into the air handler, which moves the heated air throughout the house. Since the heat pump or refrigerator uses a certain amount of work to move the refrigerant, the amount of energy deposited on the hot side is greater than taken from the cold side. One common type of heat pump works by exploiting the physical properties of a volatile evaporating and condensing fluid known as a refrigerant. Many heat pumps also use an auxiliary heat source for heating mode. This means that, even though the heat pump is the primary source of heat, another form is available as a back-up. Electricity, oil, or gas are the most common sources. This is put in place so that if the heat pump fails or can’t provide enough heat, the auxiliary heat will kick on to make up the difference. Geothermal heat pumps use shallow ground (which is often at a constant temperature not too far below “shirt-sleeve temperature”) as a heat source and sink, and water as the heat transport medium. They work in the same manner as an air-to-air heat pump, but instead of indoor and outdoor coils they use water pumped through earth materials as a heat transfer medium. These are environmentally-friendly and a cheaper alternative in the long run due to lower operating cost. In HVAC applications, a heat pump is typically a vapor-compression refrigeration device that includes a reversing valve and optimized heat exchangers so that the direction of heat flow may be reversed. The reversing valve switches the direction of refrigerant through the cycle and therefore the heat pump may deliver either heating or cooling to a building. In the cooler climates the default setting of the reversing valve is heating. The default setting in warmer climates is cooling. Because the two heat exchangers, the condenser and evaporator, must swap functions, they are optimized to perform adequately in both modes. As such, the efficiency of a reversible heat pump is typically slightly less than two separately optimized machines. 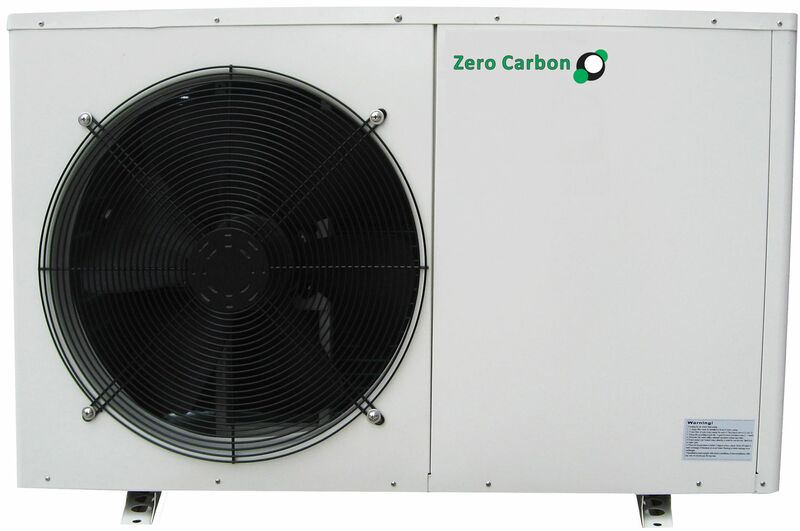 In somewhat rare applications, both the heat extraction and addition capabilities of a single heat pump can be useful, and typically results in very effective use of the input energy. For example, when an air cooling need can be matched to a water heating load, a single heat pump can serve two useful purposes. That is, a heat pump domestic water heater located in the living area of a home could cool the home, reducing or eliminating the need for additional air conditioning. This installation would be best-suited to a climate that is warm or hot most of the year. Since 2001, carbon dioxide, R-744, has increasingly been used, utilizing the transcritical cycle. In residential and commercial applications, the hydrochlorofluorocarbon (HCFC) R-22 is still widely used, however, HFC R-410A does not deplete the ozone layer and is being used more frequently. Hydrogen, helium, nitrogen, or plain air is used in the Stirling cycle, providing the maximum number of options in environmentally friendly gases. More recent refrigerators use R600A which is isobutane, and does not deplete the ozone and is friendly to the environment. Dimethyl ether (DME) is also gaining popularity as a refrigerant. When comparing the performance of heat pumps, it is best to avoid the word “efficiency” which has a very specific thermodynamic definition. The term coefficient of performance (COP) is used to describe the ratio of useful heat movement to work input. Most vapor-compression heat pumps use electrically powered motors for their work input. However, in most vehicle applications, shaft work, via their internal combustion engines, provide the needed work. When used for heating a building on a mild day of say 10 °C, a typical air-source heat pump has a COP of 3 to 4, whereas a typical electric resistance heater has a COP of 1.0. That is, one joule of electrical energy will cause a resistance heater to produce one joule of useful heat, while under ideal conditions, one joule of electrical energy can cause a heat pump to move much more than one joule of heat from a cooler place to a warmer place. Note that the heat pump is more efficient on average in hotter climates than cooler ones, so when the weather is much warmer the unit will perform better than average COP. Conversely in cold weather the COP approaches 1. Thus when there is a wide temperature differential between the hot & cold reservoirs the COP is lower (worse). When there is a high temperature differential on a cold day, e.g., when an air-source heat pump is used to heat a house on a very cold winter day of say 0 °C, it takes more work to move the same amount of heat indoors than on a mild day. Ultimately, due to Carnot efficiency limits, the heat pump’s performance will approach 1.0 as the outdoor-to-indoor temperature difference increases for colder climates (temperature gets colder). This typically occurs around −18 °C (0 °F) outdoor temperature for air source heat pumps. Also, as the heat pump takes heat out of the air, some moisture in the outdoor air may condense and possibly freeze on the outdoor heat exchanger. The system must periodically melt this ice. In other words, when it is extremely cold outside, it is simpler, and wears the machine less, to heat using an electric-resistance heater than to strain an air-source heat pump. Geothermal heat pumps, on the other hand, are dependent upon the temperature underground, which is “mild” (typically 10 °C at a depth of more than 1.5m for the UK) all year round. Their COP is therefore normally in the range of 4.0 to 5.0. The design of the evaporator and condenser heat exchangers is also very important to the overall efficiency of the heat pump. The heat exchange surface areas and the corresponding temperature differential (between the refrigerant and the air stream) directly affect the operating pressures and hence the work the compressor has to do in order to provide the same heating or cooling effect. Generally the larger the heat exchanger the lower the temperature differential and the more efficient the system. Heat exchangers are expensive, requiring drilling for some heat-pump types or large spaces to be efficient, and the heat pump industry generally competes on price rather than efficiency, as it is already at a price disadvantage when it comes to initial investment (not long-term savings) compared to conventional heating solutions like boilers, so the drive towards more efficient heat pumps and air conditioners is often led by legislative measures on minimum efficiency standards. In cooling mode a heat pump’s operating performance is described as its energy efficiency ratio (EER) or seasonal energy efficiency ratio (SEER), and both measures have units of BTU/(h·W) (1 BTU/(h·W) = 0.293 W/W). A larger EER number indicates better performance. The manufacturer’s literature should provide both a COP to describe performance in heating mode and an EER or SEER to describe performance in cooling mode. Actual performance varies, however, and depends on many factors such as installation, temperature differences, site elevation, and maintenance. Heat pumps are more effective for heating than for cooling if the temperature difference is held equal. This is because the compressor’s input energy is largely converted to useful heat when in heating mode, and is discharged along with the moved heat via the condenser. But for cooling, the condenser is normally outdoors, and the compressor’s dissipated work is rejected rather than put to a useful purpose. For the same reason, opening a food refrigerator or freezer heats up the room rather than cooling it because its refrigeration cycle rejects heat to the indoor air. This heat includes the compressor’s dissipated work as well as the heat removed from the inside of the appliance. is the compressor’s dissipated work. The COP increases as the temperature difference, or “lift”, decreases between heat source and destination. The COP can be maximised at design time by choosing a heating system requiring only a low final water temperature (e.g. underfloor heating), and by choosing a heat source with a high average temperature (e.g. the ground). Domestic hot water (DHW) and radiators require high water temperatures, affecting the choice of heat pump technology. One conclusion is that while current ‘best practice’ heat pumps (ground source system, operating between 0 and 35 Celsius) have a COP of normally around 4, no better than 5, the maximum achievable is (see under Carnot-cycle) 12. This means that in the coming decades, the energy efficiency of top-end heat pumps is likely to at least double. Cranking up efficiency requires the development of a better gas compressor, fitting HVAC machines with larger heat exchangers with slower gas flows, and solving internal lubrication problems resulting from slower gas flow. hybrid (or twin source) heat pumps: when outdoor air is above 4 to 8 Celsius, (40-50 Fahrenheit, depending on ground water temperature) they use air, when air is colder, they use the ground source. These twin source systems can also store summer heat, by running ground source water through the air exchanger or through the building heater-exchanger, even when the heat pump itself is not running. This has dual advantage: it functions as a low running cost for air cooling, and (if ground water is relatively stagnant) it cranks up the temperature of the ground source, which improves the energy efficiency of the heat pump system by roughly 4 percent for each degree in temperature rise of the ground source. By definition, all heat sources for a heat pump must be colder in temperature than the space to be heated. Most commonly, heat pumps draw heat from the air (outside or inside air) or from the ground (groundwater or soil). The heat drawn from the ground is in most cases stored solar heat, and it should not be confused with direct geothermal heating, though the latter will contribute in some small measure to all heat in the ground. Geothermal heat, when used for heating, requires a circulation pump but no heat pump, since for this technology the ground temperature is higher than that of the space that is to be heated, so the technology relies only upon simple heat convection. Other heat sources for heat pumps include water; nearby streams and other natural water bodies have been used, and sometimes domestic waste water (via drain water heat recovery) which is often warmer than cold winter ambient temperatures (though still of lower temperature than the space to be heated). Air source heat pumps are relatively easy (and inexpensive) to install and have therefore historically been the most widely used heat pump type. However, they suffer limitations due to their use of the outside air as a heat source or sink. The higher temperature differential during periods of extreme cold or heat leads to declining efficiency, as explained above. In mild weather, COP may be around 4.0, while at temperatures below around −8 °C (17 °F) an air-source heat pump can achieve a COP of 2.5 or better, which is considerably more than the energy efficiency that may be achieved by a 1980’s heating systems, and very similar to state of the art oil or gas heaters. The average COP over seasonal variation is typically 2.5-2.8, with exceptional models able to exceed 6.0 in very mild climate, but not in freezing climates. At least two manufacturers are selling heat pumps that maintain better heating output at lower outside temperatures than conventional air source heat pumps. These low temperature optimized models make air source heat pumps more practical for cold climates because they don’t freeze to a stop that quickly. Some models however, defrost their outdoor unit electrically at regular intervals, which increases electricity consumption dramatically during the coldest weeks. In areas where only one fossil fuel is currently available (e.g. heating oil; no natural gas pipes available) these heat pumps could be used as an alternative, supplemental heat source to reduce a building’s direct dependence on fossil fuel. Depending on fuel and electricity prices, using the heat pump for heating may be less expensive than fossil fuel. A backup, fossil-fuel heat source may still be required for the coldest days. Ground source heat pumps, which are also referred to as Geothermal heat pumps, typically have higher efficiencies than air-source heat pumps. This is because they draw heat from the ground or groundwater which is at a relatively constant temperature all year round below a depth of about thirty feet (9 m). This means that the temperature differential is lower, leading to higher efficiency. Ground-source heat pumps typically have COPs of 3.5-4.0 at the beginning of the heating season, with lower COPs as heat is drawn from the ground. The trade off for this improved performance is that a ground-source heat pump is more expensive to install due to the need for the drilling of wells or digging of trenches in which to place the pipes that carry the heat exchange fluid. When compared versus each other, groundwater heat pumps are generally more efficient than heat pumps using heat from the soil. Ground sources tend to accumulate cold, which is a significant problem if ground water is stagnant and they have been designed to be just big enough. One way to fix cold accumulation, is to use ground water to cool the floors on hot days. Another way is to make large solar collectors, for instance by putting plastic pipes just under the roof, or by putting coils of black polyethylene pipes under glass on the roof, or by piping the tarmac of the parking lot. The most cost effective way is to put a large air to water heat exchanger on the rooftop. Solid state heat pumps using the Thermoelectric Effect have improved over time to the point where they are useful for certain refrigeration tasks. Commercially available technologies have efficiencies that are currently well below that of mechanical heat pumps, however this area of technology is currently the subject of active research in materials science. Near-solid-state heat pumps using Thermoacoustics are commonly used in cryogenic laboratories. 1748: William Cullen demonstrates artificial refrigeration. 1834: Jacob Perkins builds a practical refrigerator with diethyl ether. 1852: Lord Kelvin describes the theory underlying heat pump. 1855–1857: Peter Ritter von Rittinger develops and builds the first heat pump. ^ BSRIA, “European energy legislation explained”, www.bsria.co.uk, May 2010. ^ a b c d The Canadian Renewable Energy Network ‘Commercial Earth Energy Systems’, Figure 29. . Retrieved December 8, 2009. ^ Technical Institute of Physics and Chemistry, Chinese Academy of Sciences ‘State of the Art of Air-source Heat Pump for Cold Region’, Figure 5. . Retrieved April 19, 2008. ^ a b SINTEF Energy Research ‘Integrated CO2 Heat Pump Systems for Space Heating and DHW in low-energy and passive houses’, J. Steen, Table 3.1, Table 3.3. . Retrieved April 19, 2008. ^ “Heat pumps sources including groundwater, soil, outside and inside air)” (PDF). Retrieved 2010-06-02. ^ EnergyIdeas.org, “Product & Technology Review: Acadia Heat Pump“, Table 1, Dec 2007. ^ “the IPCC 4th Working Group III report” (PDF). Retrieved 2010-06-02. ^ Banks, David L.. An Introduction to Thermogeology: Ground Source Heating and Cooling. Wiley-Blackwell. ISBN 978-1-4051-7061-1.